"Vacalaca 3D" is new 3D music video from the Chilean gore metal band DORSO. Produced by Tridi Dorsalia Films & Productions, Directed by José "Pepe" Perez. DORSO's music is inspired by the stories of Lovecraft, horror films and any bizarre story imaginable, with monstrous allegories, using black humor and allusions to witchcraft. Most of their lyrics are composed in Castilian language. Since their inception they have played in varying styles including progressive rhythms, grindcore, jazz and the use of recordings from classic horror films. Finally, Dial M for Murder will be available on Blu-ray 3D. This marks the first 3D film from the 1950's to be released in this format. Originally shot in WarnerVision 3Dimension (basically two cameras), the studio had left and right film reels to remaster this from. Despite the common misconception that 1950's films were all red/cyan anaglyph, most were in fact shot with two cameras, projected with two synchronized projectors, and viewed with passive glasses (similar to RealD). It wasn't until the 1980's 3D revival that many 50's films were rereleased as mediocre anaglyphs, because of the expense and lack of equipment/personnel to operate twin projectors. 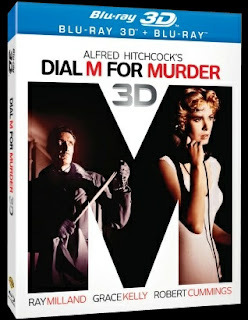 By the release of Dial M for Murder, 3D was on the way out in favor of CinemaScope (a much cheaper-to-produce way to get people away from their TV's and back in the cinema). Most theaters opted to only show the film in 2D. Since then, the only way to see it was on some very low quality anaglyph copies or a rare dual-projector screening.Finally, emerging filmmakers will be able to study and learn what Hitchcock did with 3D almost 60 years ago, and classic cinema fans will be able to watch the Academy Award-winning Grace Kelly in all her 3D glory. I for one hope this is the start of many Blu-ray releases of vintage stereoscopic films. Jeff Baker, Executive Vice President and General Manager, Theatrical Catalog, said in the press release: "Given the current trend toward 3D, we're delighted to be releasing this authentic classic 3D. This is not a conversion from 2D to 3D, but an original work, with a big tip of the cap to MPI, that illustrates just how good 3D can be. The Warner library has the largest number of classic 3D titles (15) of any studio and over the years we've been looking to release them, but not until now has the technology been perfected to the point we can do that. We're hoping Dial M for Murder is the first of several classic 3D films to be released, with the long-awaited, much requested "House of Wax" expected next." Above is "Life of Hidden Stones" by Canadian artist San Base, from the 3D Blu-ray "Function of Reality". Base's work (from the video description) "utilizes mathematical algorithms and classical elements of painting and music, while harnessing the power of computer technology to bring these drastically different disciplines together."